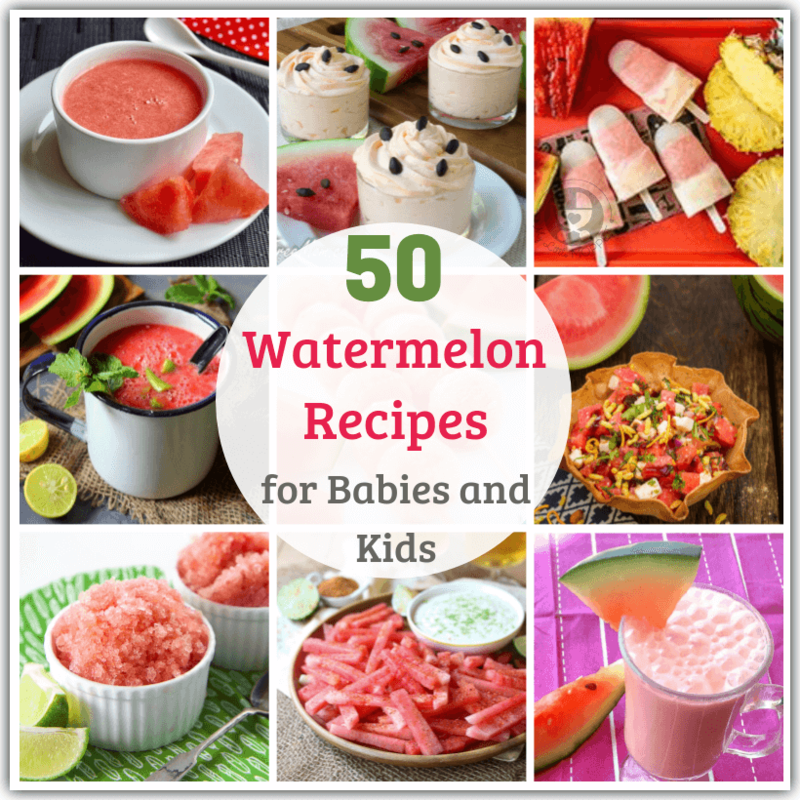 Let your little ones enjoy the goodness of watermelons with these healthy Watermelon Recipes for Babies and Kids! Make everything from chaat to cheesecake! If you take a walk around any street in India during summer, you’re sure to find at least a couple of stalls selling watermelons. They’re either sold whole, or sliced into wedges. If the shopkeeper is in a more sophisticated mood, you might find them chopped and neatly packed in covered containers. And if you’re lucky, you’ll get them with some tantalizing spices sprinkled on them! That’s how synonymous watermelons are with summers, and for good reason. They provide all the hydration and nutrients you need, making this an ideal food to give your fussy eater this season. 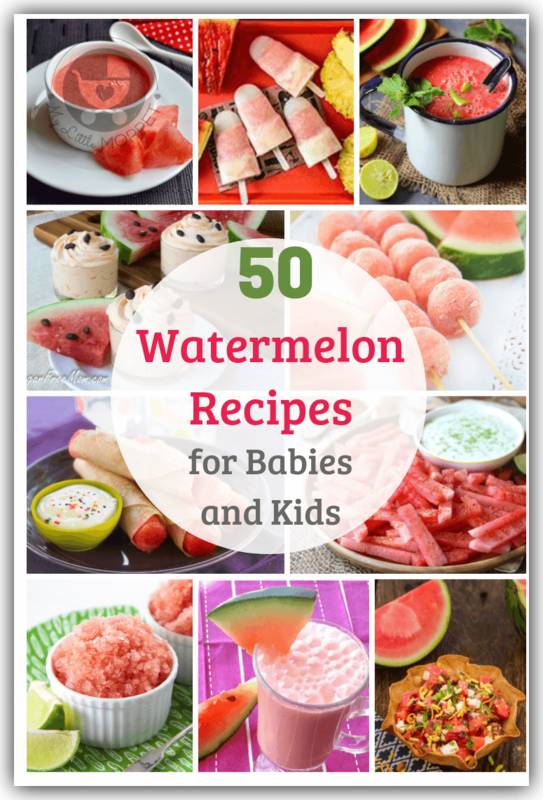 That’s why we’ve scoured the net to find 50 of the healthiest watermelon recipes for babies and kids to enjoy. 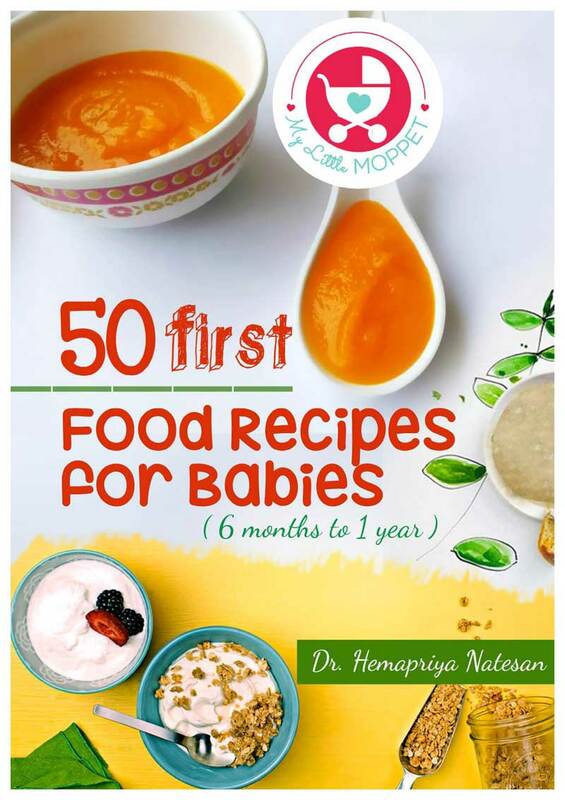 Find out if you can give your baby watermelon before proceeding with the recipes; there’s everything from smoothie to chutney to pudding! 1. Watermelon Puree (6 Months+) – GK Food Diary gives us the very basic watermelon recipe for babies – a watermelon puree. There really is nothing to this recipe – just a sweet and juicy watermelon! 2. 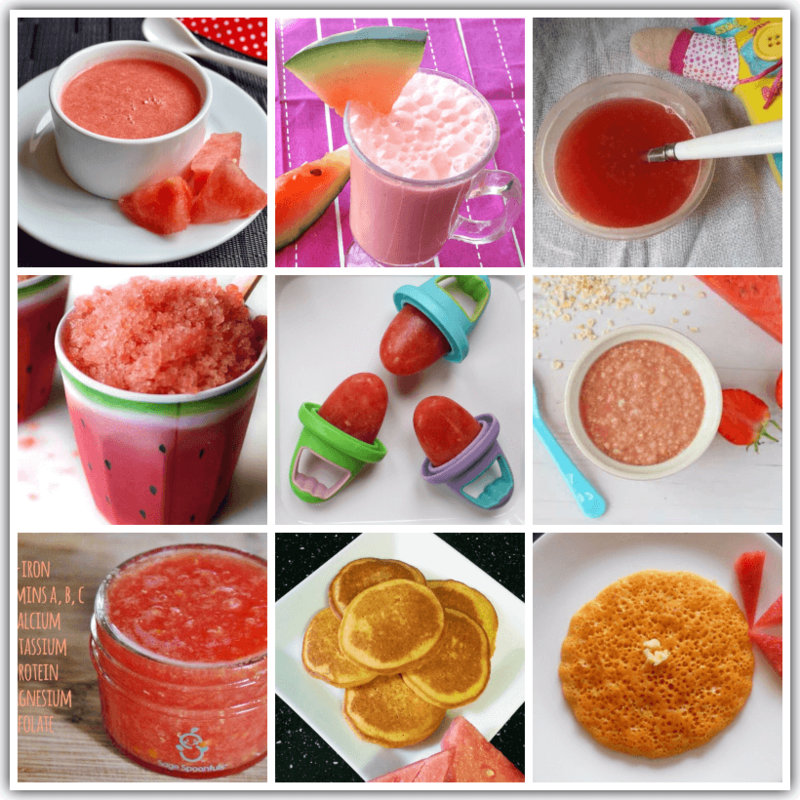 Watermelon Smoothie (8 Months+) – This is a recipe that can easily be adapted to babies and toddlers. Skip the milk and honey for babies, just ensuring your watermelon is sweet enough to make up for it. 3. Watermelon Juice (6 Months+) – Few things can be as refreshing during summer as this watermelon juice from Yummy Tummy Aarthi. Like the puree, this is a one ingredient recipe that will offer loads of hydration. 4. Watermelon Ice (9 Months+) – Once your baby is ready to handle some texture, you can go ahead and introduce this watermelon ice from Healthy Little Foodies. You can skip the zest if you think it’ll be too bitter for your little one. 5. 2 Ingredient Watermelon Popsicles (8 Months+) – If your baby seems to love watermelon and strawberries, combine them into a super summer refresher like this 2 ingredient Popsicle from Mom to Mom Nutrition! 6. Strawberry Watermelon Porridge (8 Months+) – Here’s the perfect way to add some color and sweetness to your baby’s porridge – watermelon! My Fussy Eater has an easy recipe that adds watermelon and strawberry puree to cooked oatmeal. 7. Watermelon with Red Lentils (8 Months+) – Green Leaves has a recipe that includes watermelon in your baby’s lunch menu. All you need to do is add watermelon juice or puree to cooked rice and lentils for a complete meal. 8. Watermelon Pancakes (10 Months+) – With just three ingredients, Simple Toddler Recipes gives us a refreshing breakfast recipe for our babies on hot summer mornings. 9. Watermelon Dosa (10 Months+) – This recipe from Konkani Food Recipes is based on a traditional dosa recipe called polo. You can use either rind or flesh, but the flesh is recommended for babies, while also skipping the salt. 10. Watermelon Lemonade – Two of the most refreshing drinks come together to create this winning summer cooler – watermelon lemonade! 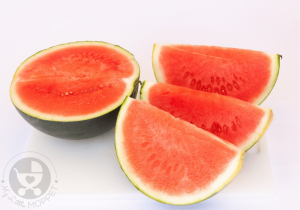 While the watermelon may be sweet, you may still need some sugar to counter the lemon flavor. 11. 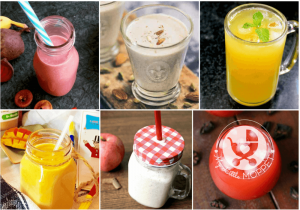 Watermelon Lassi – Cook Like Priya has an absolutely healthy recipe for lassi. The best part is that it doesn’t even need sugar if your watermelon is sweet enough. 12. 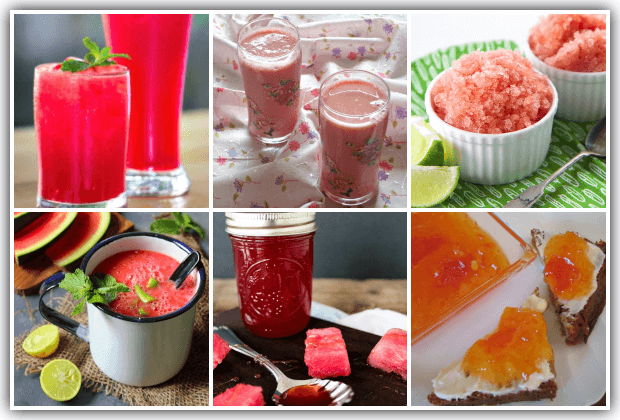 Watermelon Slushie – This watermelon slush from Baby Foode is so delicious and health too – all it needs is watermelon, honey and lime! If you skip the honey, you can also make it work for babies under one. 13. Watermelon Gazpacho – Watermelon is inherently refreshing, and when you turn it into a cold soup with cucumbers and tomatoes, you have the ultimate remedy to beat the heat. Get the recipe at Priya Kitchenette. 14. 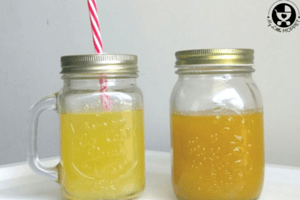 Watermelon Syrup – This syrup from Domestically Blissful is quite versatile, as long as you cut down on the sugar and don’t go overboard with it! 15. Watermelon Rind Preserve – This is an interesting recipe from All Recipes that uses even the rind of the watermelon! Skip the sugar and opt for jaggery for a darker colored preserve. 16. Deep Fried Watermelon Rind – If your kids would like a crunchy snack and not know it’s a fruit, then this recipe from Sew Historically is your best bet! Watermelon rind is cut into sticks and deep fried with a batter of flour and salt for a fun snack! 17. Watermelon Pizza – If you’ve got a kiddie party planned for this summer, don’t look further than this watermelon pizza from Practically Functional! It has the best of all worlds in one recipe! 18. Watermelon Rolls – Here’s a healthier and lighter alternative to sausage rolls – watermelon rolls. Make sure to have some interesting dips on hand to dip the rolls. 19. 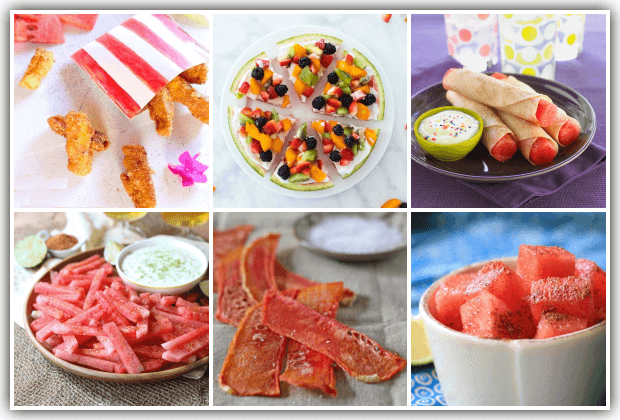 Watermelon Fries – Kids clamouring for fries but you don’t want to spend time in front of the oven in the heat? Check out these watermelon ‘fries’ recipe from Abbey’s Kitchen – complete with a refreshing dip! 20. Dried Watermelon Slices – Parents usually have trouble feeding their kids dried fruits, but these dehydrated watermelon slices from Yankee Kitchen Ninja will be an exception. 21. 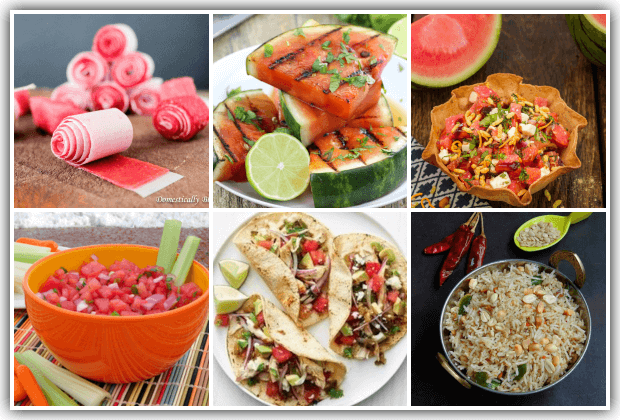 Spicy Watermelon – All Recipes has a simple recipe that serves as a finger food for toddlers. Spices like cumin, coriander and lime make it a welcome change from the sweet stuff. 22. Watermelon Fruit Leathers – Kids always enjoy snacks in unusual shapes and this fruit leather from Domestically Blissful is perfect in that sense! 23. Grilled Watermelon – The Stay at Home Chef shows us how even a watery summer fruit like watermelon can be grilled to perfection without losing its yumminess! Cilantro and lime add to the freshness of the recipe. 24. Watermelon Papdi Chaat – Elephant Atta gives us a full chaat recipe from scratch, including making the papdi. You can also make it healthier by using Sathumaavu instead of plain flour. 25. Watermelon Salsa – Salsa is one of those things you can make when you’re not sure about what to cook! Food Hero features a watermelon salsa that can be scooped up with a roti or bread. 26. Chicken Watermelon Tacos – Copy Me That has an interesting recipe with watermelon – tacos! 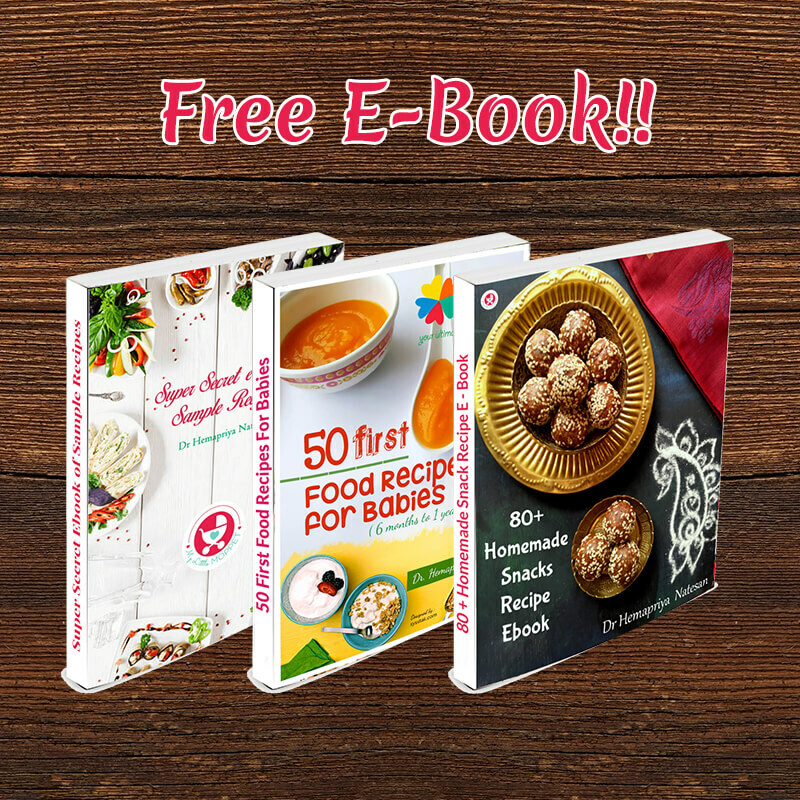 Kids will enjoy eating healthy ingredients like chicken and veggies in a fun format. 27. 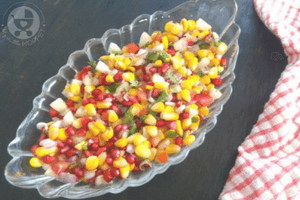 Watermelon Seeds Rice – If your kids are fans of traditional rice dishes like lemon rice and coconut rice, they’re sure to love this watermelon seeds rice recipe from Archana’s Kitchen – perfect for the lunchbox! 28. 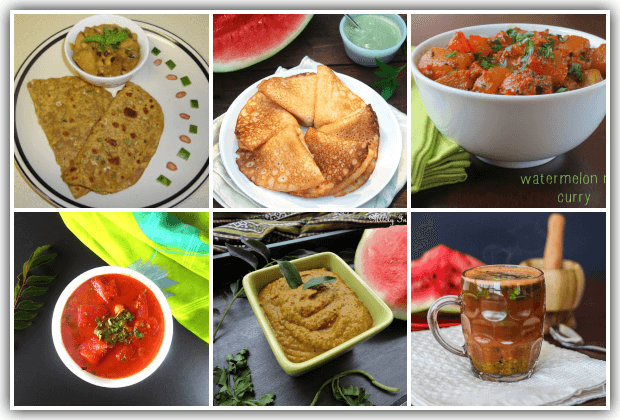 Watermelon Rind Paratha – The rind of the watermelon makes it perfect to add to parathas, and you can mix it up with other stuffings too. Check out the recipe for watermelon paratha from Sailaja Kitchen. 29. Watermelon Rind Dosa – If you can make paratha out of it, there’s no reason you can’t make dosa as well! Holy Cow Vegan has a lovely dosa recipe using coconut milk and poha for beautifully light dosas. 30. Watermelon Rind Curry – My Heart Beets uses the rind in a different way – by making a curry out of it! This curry is pretty versatile, and can be paired with rice, rotis or dosas. 31. Fresh Watermelon Curry – It’s not just the rind that can be turned into curry, the flesh of a watermelon also works! Check out Healing Tomato’s traditional Rajasthani recipe using chickpeas along with watermelon puree and chunks. 32. Watermelon Rind Chutney – Mildly Indian combines watermelon rind with traditional chutney ingredients like mustard seeds, red chillies and dals for a smooth and savory preparation. 33. 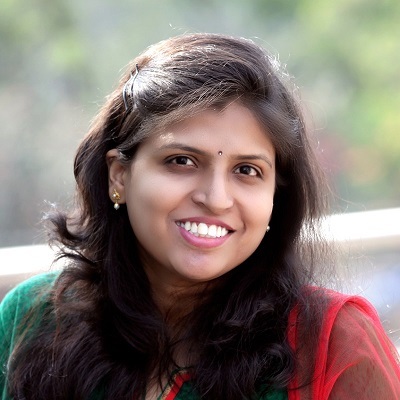 Watermelon Rasam – Archana’s Kitchen gives us a unique South Indian recipe – watermelon rasam! It contains watermelon juice with lots of spices, making it a cooling and healing drink for the summer. 34. Watermelon Fruit Salad – Fork Knife Swoon gives us a fruit salad bowl that’s just bursting with color, freshness and antioxidants! Even fussy eaters cannot resist the bright colors in this dish! 35. Mini Watermelons – This snack idea from Nutrition Studies is just genius – I’m surprised no one thought of it sooner! With cucumbers and watermelon flesh, you’re all set to make cute little mini watermelons! 36. Watermelon Sorbet with Mint – It’s amazing the different dishes you can make with just watermelon, and this recipe from Easy Baby Meals is no exception! The mint adds an extra freshness, but you can skip it if your child doesn’t like it. 37. 100% Watermelon Popsicles – Just like it’s name suggests, this recipe from Tikkido is nothing but the wholesome goodness of this delightful fruit. It’s a great idea for a kiddie party or when your child has friends over to play. 38. 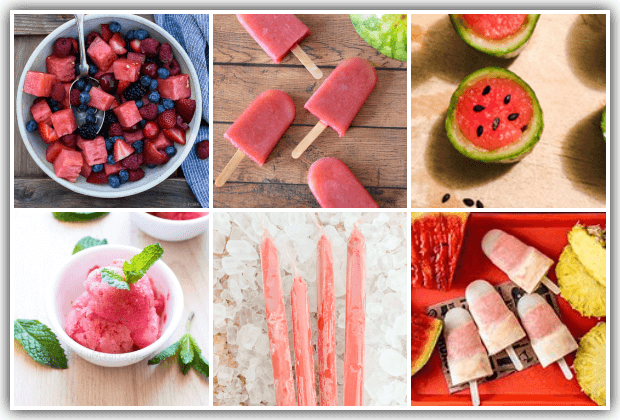 Strawberry Watermelon Popsicles – Strawberries and watermelon make a great combination – they’re both pinkish red, they’re both filled with nutrients and they taste great together! The two come together in this Popsicle recipe from She Saved. 39. Watermelon Pineapple Creamsicles – These creamsicles from Traegar Grills are no ordinary fruit pops – they’re made from fruit that is first grilled and then pureed and then turned into creamsicles! 40. Watermelon Passion Fruit Cheesecake – The name of this recipe may sound complicated, but it really isn’t that hard! What’s more, it’s vegan and has loads of healthy ingredients!  Check out the recipe from Easy Baby Meals. 41. Watermelon Mousse – This mousse recipe from Sugar Free Mom takes a little more effort to make, but the result is a beautifully creamy dessert! 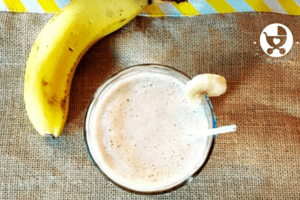 The best part is you can make this without any sugar at all! 42. 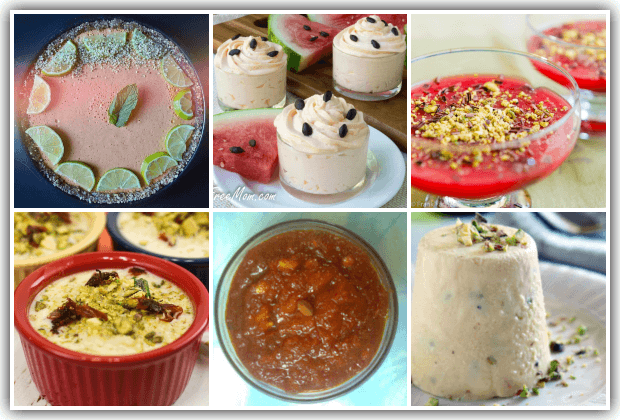 Watermelon Pudding – This is a good dessert to serve guests on warm summer evenings. With spices and real watermelon juice, this recipe from Memorie di Angelina can be made healthier by cutting down on the sugar. 43. Watermelon Rind Kheer – The Schizo Chef features a no waste recipe using grated watermelon rind, making use of something we always toss into the trash. Turn it into a kheer and see how you can make use of it. 44. Watermelon Halwa – Halwa is a popular dish in every Indian home and you can use any fruit for it, as we can see in this recipe from Anita’s Recipes. Using the actual watermelon here enables you to cut down on the sugar needed. 45. Watermelon Kulfi – You can call this recipe from Awesome Cuisine a loaded kulfi, since it contains musk melon, cucumber and cream, along with watermelon. 46. Watermelon Kesari – Kesari is one of the easiest sweet dishes you can make at home, with ingredients you already have. And if you’ve got some juicy watermelon on hand, do try out this watermelon kesari from Clicks n Bites! 47. Sprouted Watermelon Seed Butter – If your kids enjoy nut butters like peanut butter, then this watermelon seed butter from Moon and Spoon and Yum is definitely worth a try! Sprouting increases the health benefits of the seeds. 48. Frozen Watermelon Kebabs – Frozen kebabs? Yes, it is possible when you’re using watermelon kebabs! To make this even more colorful, try alternating watermelon with other melons. 49. 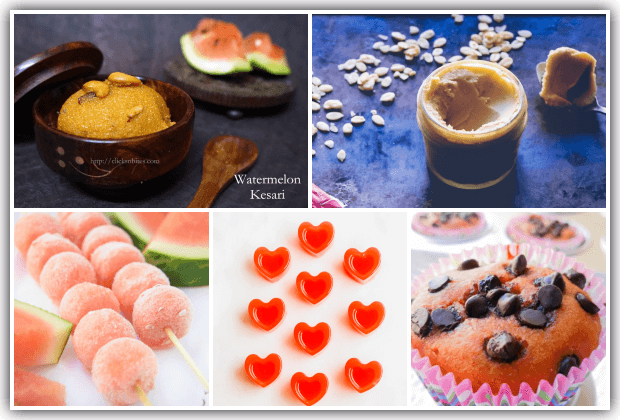 Watermelon Gut Gummies – If you’d like to improve your child’s gut health, try making these watermelon gut gummies from Abras Kitchen. You can use vegetarian gelatin or China grass to set the gummies. 50. Watermelon Cupcakes – This is one of those healthy baking recipes that can be eaten without worry! Platter Share makes this recipe without eggs, or refined flour. You can skip the baking soda and use organic jaggery as the sweetener.